'Peach Frappe' ( Bernard Hamner by Shepard Iris Garden, R. 1992). Seedling #82-216. BB, 27" (69 cm). Midseason bloom. Standards white, midrib heavily infused peach; style arms soft peach, laced; falls peach, laced white edge; beards coral, tipped peach; heavily ruffled. (seedling #75-11: ( 'Touch of Envy' x ( 'Touché']] x 'Misty Dawn')) x seedling #75-225: (((( 'Foxcharm' x 'Campus Flirt') x 'Becky Lee') x ( 'Touché' x 'Misty Dawn')) x 'Peach Sundae')) X 'Peach Sundae'. 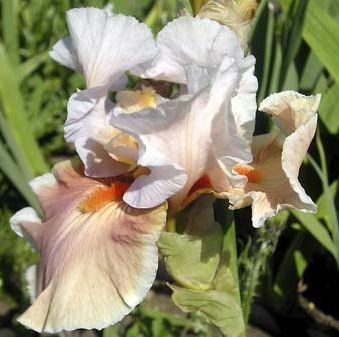 Hamner Iris, Shepard Iris 1992. From AIS Bulletin #285 April 1992 Introducing PEACH FRAPPE (BB-27"-M) Falls are peach with laced white edge. The same rich peach flames into the midrib of the white standards. The stands are open just enough to reveal beautiful soft peach stylearms with lace edging. Coral beards finish the complete bloom. Sdlg. #82-216 ((Hamner 75-11 x 75-225) X Peach Sundae)). $25.00. Shepard Iris Garden.